I've spent the past weekend dress hunting. I recently completed all of the requirements for my BDes (Bachelor of Design) at OCAD University here in Toronto, and my convocation ceremony will be at the beginning of June. I know it sounds absolutely insane to start shopping now, but the truth of the matter is I want to look good, and hopefully find a dress I can wear for more than one occasion. I have an extreme pear shape, usually I can wear a top anywhere from size 16-20, and on the bottom I wear a size 22-26. Unfortunately this means that when I buy dresses I have to get them big enough to cover my booty, and my modestly endowed bosom gets left in the drapey mess left behind. Most of the time I'll resort to pinning, like clothing companies do for their mannequins. I was using safety pins until I figured I could just use a raw snap button you'd find at Michaels, Walmart or Fabricland where the sewing hardware can be found. No matter how you pin it, generally the clothing gets damaged, so I settled on buying only dresses with empire waists (they're usually more forgiving on the bottom half) or going with a 2 piece ensemble. Now I search way ahead of time, so that I can get the dress altered to fit my body properly. This dress from IGIGI is my top pick right now, it's a classic and I'm in love with the neckline. I'll definitely have to have it fitted properly, but this dress has rave reviews. If I went with this dress I could wear it multiple times, changing it up with accessories for a different vibe. For my convocation I'd probably pair it with a chunky statement necklace, and some cute pumps. Do you think it's too dressy for this occasion? I adore this dress from Kiyonna. It's a little black dress but with a twist. I'm not usually big on gold, but lace always gets my heart pumping. Apparently the dresses from Kiyonna are worth every penny in quality and style. Now, I'm not entirely sure if the first two are too dressy for a convocation ceremony, so I have these two lighter, more playful dresses on my roster. 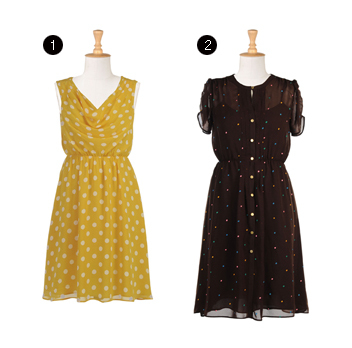 I have so many ideas for both of these dresses, but I think I prefer the yellow, belted with a dark purple/red cardi. The BEST part about eShakti is that the sizes range from regular to plus, but on top of that, for an extra $7.00 (I think, It's actually free right now until March 31st) they will customize the dress to your measurements, and height. You can also choose to have the dress shortened/lengthened or even change the type of sleeves it has! What's a girl to do?! I have time, but I want to make sure I love the dress too. What do you think is more appropriate for a convocation? What would you wear? ooh! congratulations! this is definitely an event to dress up. I love the first one! so sassy. and I love the last one as well. Very cute and fun. I'm in love with it, but I can't decide if another black dress is the way to go. I'll be sure to put up pics once I decide! I love the first dress!! !